Beginning in March 2019, LPL makes it easier for you to wear your heart on your sleeve. 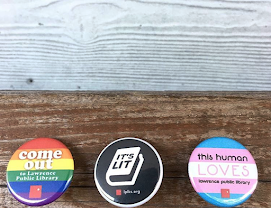 Borrow a button maker and, for a two-hour checkout period, you can have fun creating slogans, art, swag, and 2D visible signals about who you are on the inside. Then pin 'em anywhere you please. Jake from Accounts is a button-making whiz. Like our Chromebook laptops, these button makers check out for 2 hours from the Tech Desk on the library's lower level, and are for use inside the library only. There are two button makers - one for a 1" button and one for a 1.25" button. You can bring your own button-making supplies or purchase a button-making set from the Tech Desk. Button makers will be available on a first-come, first-serve basis. Tech Desk staff will not take or track reservations. If you need help operating a button maker, Tech staff can give you a quick assist or you can book a one-on-one session for a more in-depth tutorial. There are also a ton of online resources. Questions? We're happy to help. Just ask. "Her art bursts forth with strong statements in favor of racial tolerance, peace, understanding & compassion." - Parade Magazine on artist Elizabeth "Grandma" Layton, Kansan, activist, and perennial fan of buttons.